This 7 story new building has 137 deluxe rooms including 1 executive suite. There are 5 meeting rooms with capacity from 5 to 300 persons. There is a business center with secretarial services. Hotel also has a heliport. With a contemporary style, a relaxing and cozy atmosphere, each room is designed to meet the modern businessman expectations. In-room facilities include a huge and well illuminated marble desk with an executive and comfortable chair, data port, full size mirror, coffee and tea facilities and iron and ironing board, hairdryer, safety box, mini bar. High technology award. This property has been awarded by Telmex with the High Technology award. 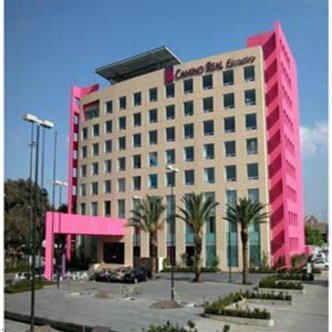 This is a recognition Telmex issue to hotels that offer the guests the most advanced telecommunications technology. In order to get this award, the hotel must provide the following: Internet access at guest and meeting rooms. - To offer audio and video conference facilities in meeting rooms. - Promote the above services through the hotel call center and web page. - To offer telecommunications and high technology services in general.